While Davide Rigon’s performances have sent Beijing Guoan to the top of the Superleague Formula championship, it is the club, rather than the driver that will be award the series "premiership" at the end of the year. With that in mind, a number of clubs will substitute their pilot or event arrange a mid season transfer as they aim for championship glory. For this weekend’s fourth round of the championship at Estoril in Portugual, a number of new faces will appear behind the wheel for the first time, while other old faces will be wearing new colours in the unique football-themed championship. Newcomers this weekend will include ex-Formula 1 driver Enrique Bernoldi and Frenchman Franck Perera while Enrico Toccacelo and Zolder pole-sitter Paul Meijer will switch teams for the Portuguese weekend. Bernoldi will fill in this weekend for Tottenham Hotspur driver Duncan Tappy. The Brazilian ex-Arrows F1 star has been competing in the US this year in the IRL IndyCar Series. Star Superleague Formula rookie Paul Meijer switches from Borussia Dortmund to the Al Ain car for his second weekend in the championship. Perera will make his Superleague Formula debut for AS Roma – replacing Enrico Toccacelo who has been snapped up by Borussia Dortmund. The young French star was actually teammates with Bernoldi at Conquest Racing at the start of the year in the US. He finished second in last year’s Champ Car Atlantic Series and qualified third fastest for the final event Champ Car race at Long Beach earlier this year. "I am really looking forward to making my Superleague Formula debut this weekend. I have heard a lot about the cars and it will be great to represent AS Roma," Perera said. "I have tested previously for Fisichella Motor Sports who manage the AS Roma Racing Team and I am a big fan of Italian football. 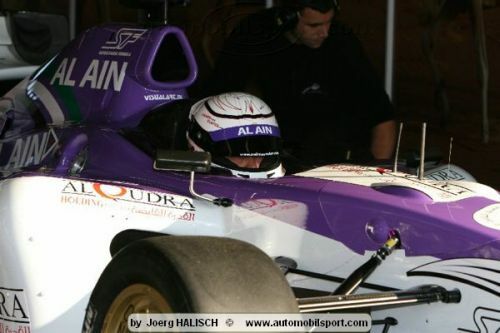 "I lived in Italy for six years racing in Formula Renault and Formula Three so it will be great to represent this club. "Superleague looks like a really nice series with a great future so it is a great opportunity for me to do some racing back in Europe." After beginning the season in the IRL IndyCar Series this year, Perera also completed a partial season in Indy Lights where he scored a race win, a pole position and a podium finish. This weekend’s Superleague Formula round at Estoril kicks off with three practice sessions on Saturday morning before the unique qualifying shoot-out kicks off at 13.15. The first of Sunday’s two races begins at 11.00. Both races are run to 44 minutes, plus 1 lap. The second race at 14.00 is a complete reverse grid event – the finishing positions of the opening race are completely reversed to determine the starting grid. Bertrand Baguette roulera en Superleague Formula à Zolder ce week-end !